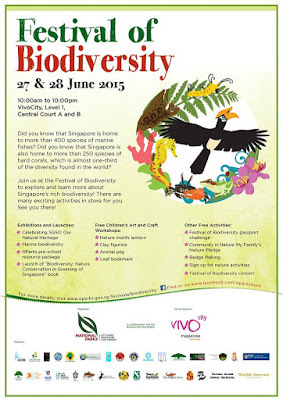 Butterflies of Singapore: Festival of Biodiversity 2015! 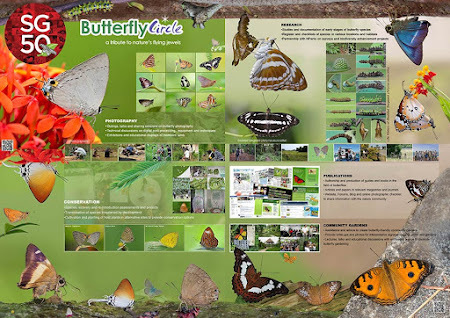 ButterflyCircle @ Festival of Biodiversity 2015! The Festival of Biodiversity (FOB) enters its fourth year, featuring and celebrating Singapore's awesome biodiversity. Held for the 3rd time at the VivoCity Shopping Mall over the school holiday weekend, the FOB2015 was again a popular draw with the visitors at Singapore's largest shopping mall. 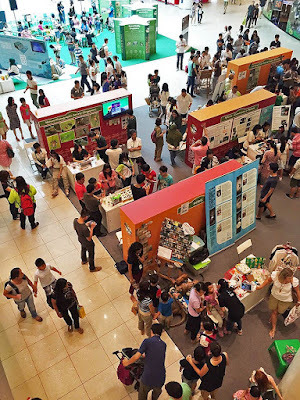 The Festival of Biodiversity is an annual event organised by the National Parks Board (NParks) in collaboration with the Biodiversity Roundtable. Initiated in 2012, the Festival aims to create awareness and foster a sense of appreciation for our natural heritage in Singapore. 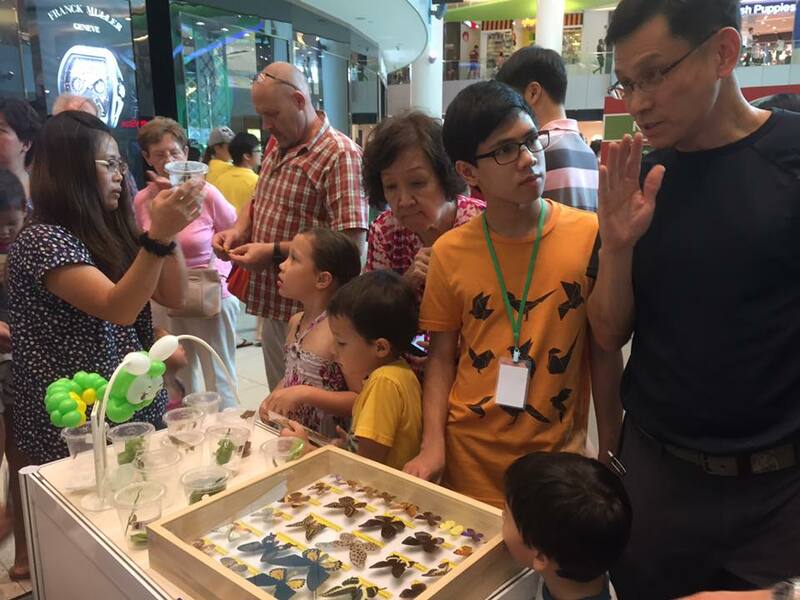 This year, in 2015 coinciding with Singapore's 50th birthday, NParks partnered 32 organisations and interest-groups to showcase Singapore's flora and fauna to members of the public. Intentionally held at a shopping mall to "convert the unconverted" to appreciate our rich biodiversity - both marine and terrestrial, and create awareness of the natural heritage that Singapore is endowed with. 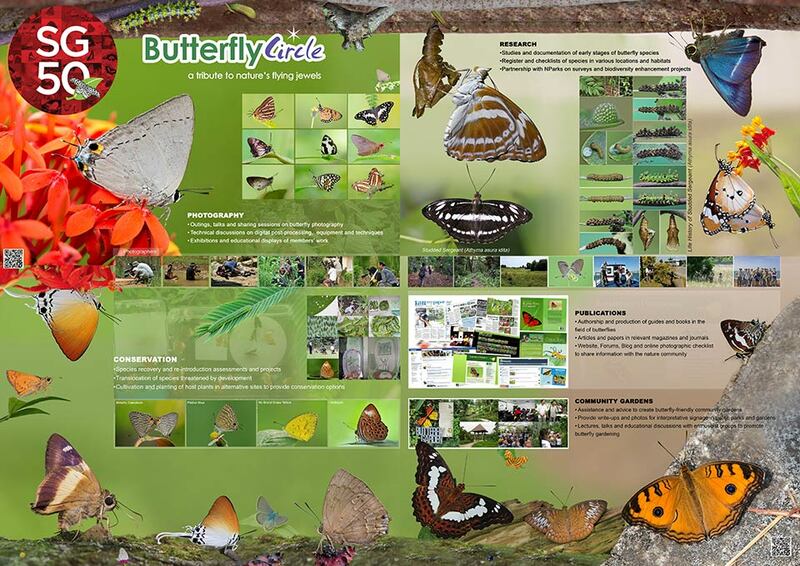 ButterflyCircle's A0 sized poster. Special thanks to CJ for putting up this fantastic work! ButterflyCircle continued to support the FOB into its fourth year, taking up a booth and highlighting the work that ButterflyCircle members have been doing over the years since it was founded. 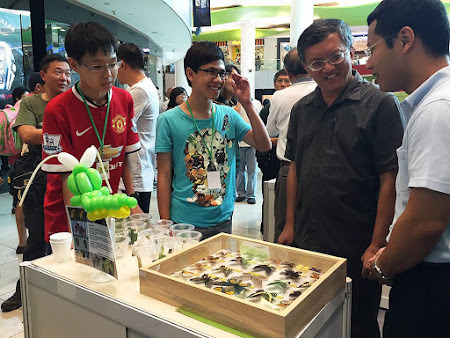 Thanks to CJ, Eng Chuan, Brian and Jerome for coming early on Saturday morning to set up our booth. 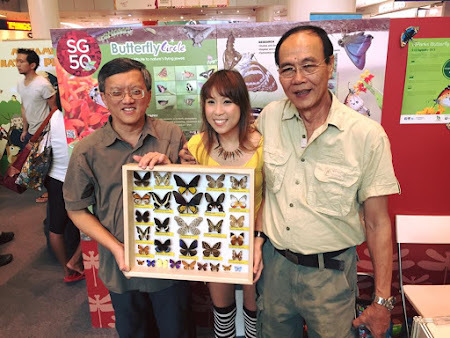 This year, we combined forces with the founder of the Seletar Country Club Butterfly Garden, Mr Foo Jit Leang. Mr Foo brought several containers of caterpillars that he was babysitting for his garden to showcase the early stages of our butterflies. After experiencing 3 years of the FOB, it was certainly a great addition to the educational boards and videos. 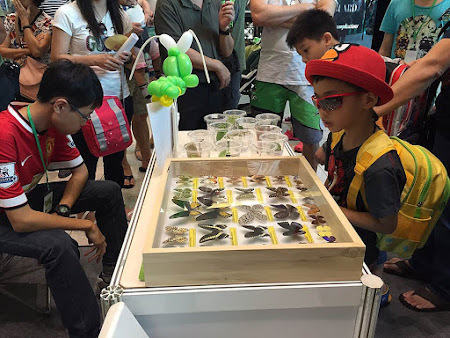 I also brought a box of specimens of Singapore's common urban butterflies and together with the caterpillars, these new attractions were a hit with the younger visitors at the booth. 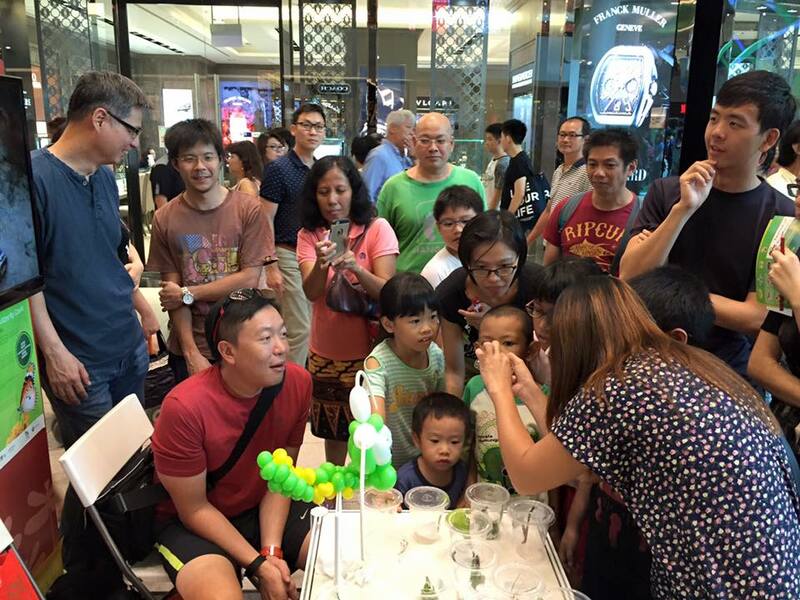 Mr Foo also had his capable assistants Mei, Cheng Khim, Vanessa and Janice to help out at the booth. Cheng Khim was especially popular with the kids as she encouraged them not to be fearful of butterfly caterpillars and carefully explaining to the kids (and their parents) how to take care of caterpillars to ensure that they become the pretty and colourful butterflies that we love in our environment! 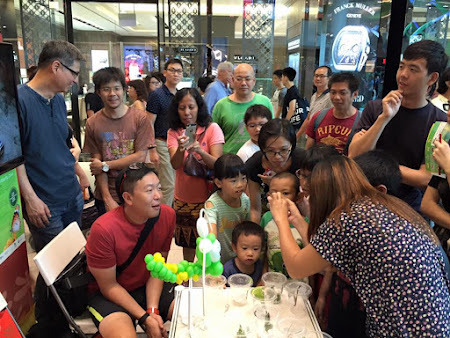 ButterflyCircle members also turned out in full force, and special thanks to Anthony, Loke, Chng, Eng Chuan, Brian, Jonathan, Cher Hern, Horace, Bob, Simon, Billy, Federick and CJ who stayed at the booth to answer any questions that visitors may have. 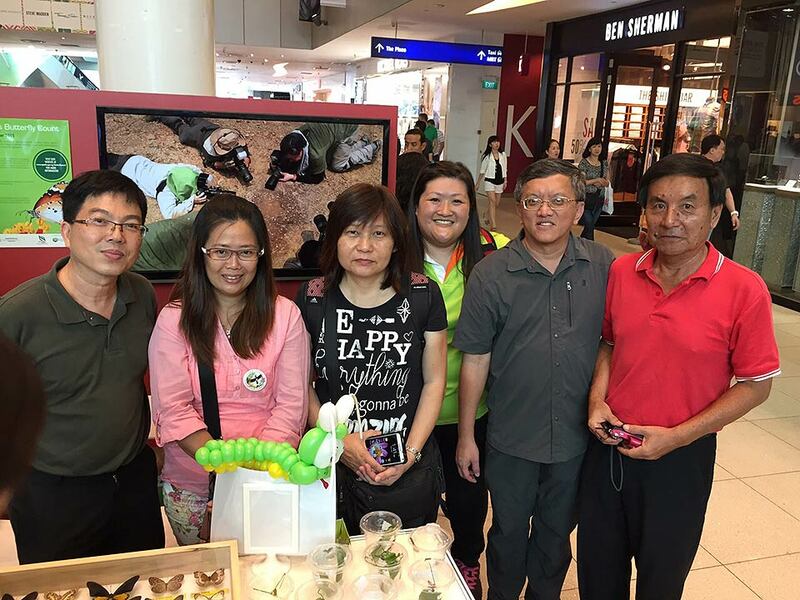 Other members like Sunny, Nelson, Mark , Tan CP, Liz, and our supporters Nikita and Siaomouse also turned up to support ButterflyCircle at the FOB. 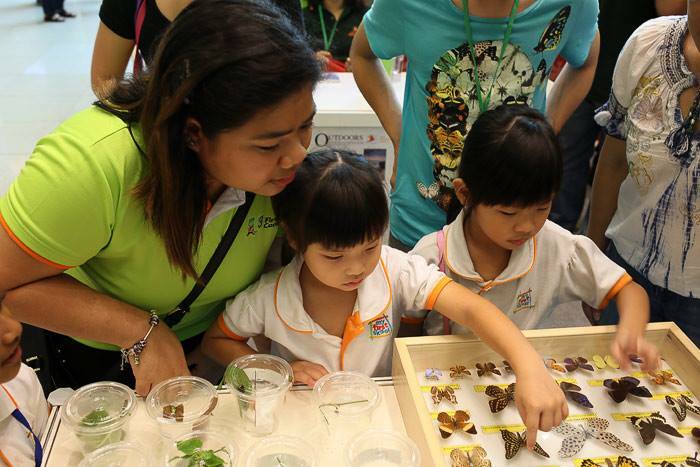 This year, ButterflyCircle's booth was swarmed with visitors, particularly the younger generation, who were fascinated by the caterpillars, pupae and the butterfly specimens. Often-heard questions were "are these real?" and "do the caterpillars bite?" were heard. 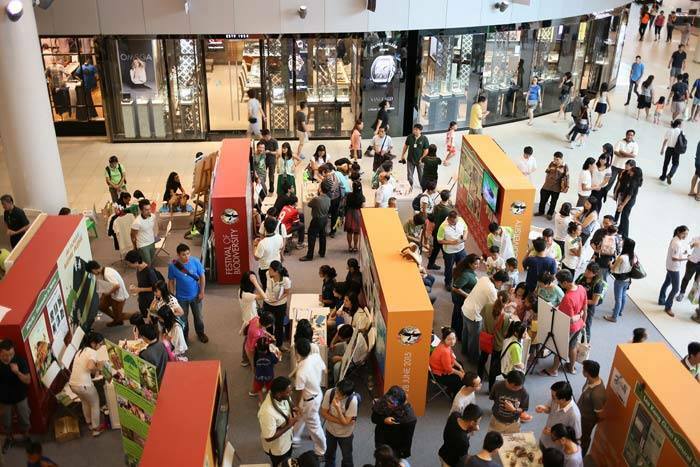 The video collage and posters, capably put together by CJ, captured the imagination and educated visitors on the less-often seen aspects about butterflies. The Guest of Honour for this year's FOB was our Minister of State for National Development, Mr Desmond Lee. 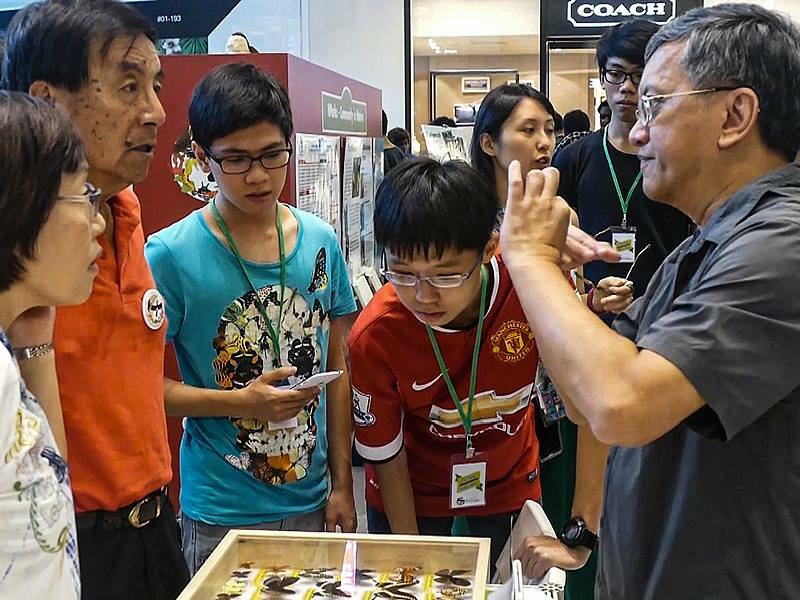 An avid nature lover himself, MOS Lee is a regular at nature, biodiversity and parks events. 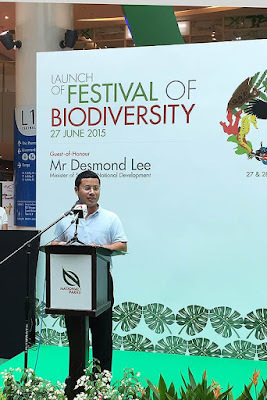 In his speech, he shared the various action plans that the government is putting in place to conserve our biodiversity - both on land and in the sea. He also highlighted the Nature Conservation Masterplan, emphasising the four key thrusts - Physical planning, Programmes, Research, and Community stewardship. 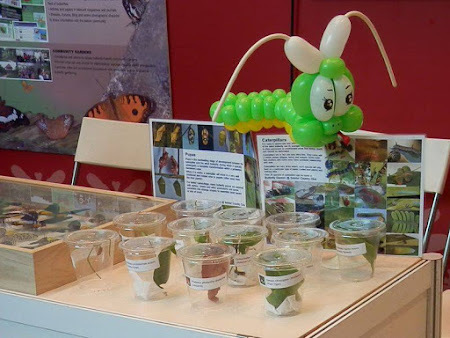 Of particular interest to ButterflyCircle members was the forthcoming National Garden Butterfly Count that will be held in September this year. 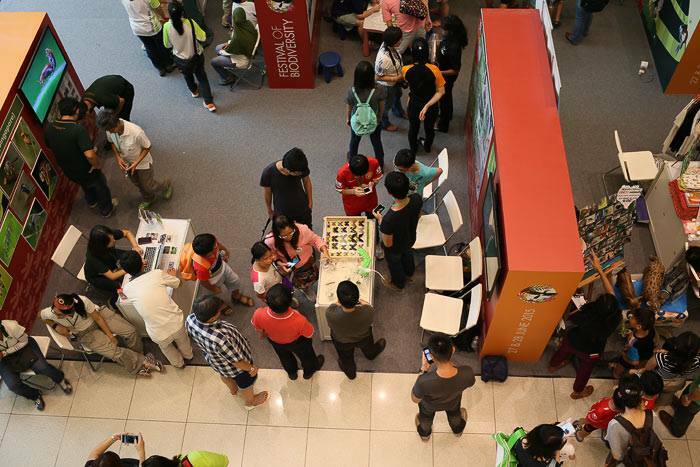 This will be aided by the use of NParks smartphone app, SGBioAtlas. MOS Lee, Mr Dhanabalan, Mr Khoo Teng Chye and other VIP guests also stopped by the ButterflyCircle booth to find out more about butterflies. MOS Lee also sportingly took a photo with the group, as he always generously obliged, like in previous years. Mr Foo Jit Leang, founder of the Seletar Country Club Butterfly Garden, with his capable assistants who made this year's ButterflyCircle booth a special experience for the kids! 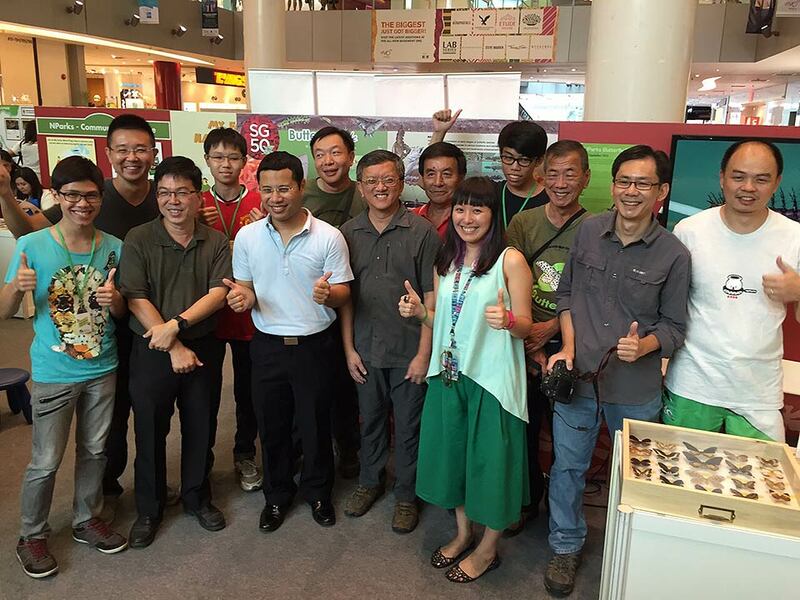 ButterflyCircle members, Mr Foo and his helpers had two long and hectic days at the FOB. 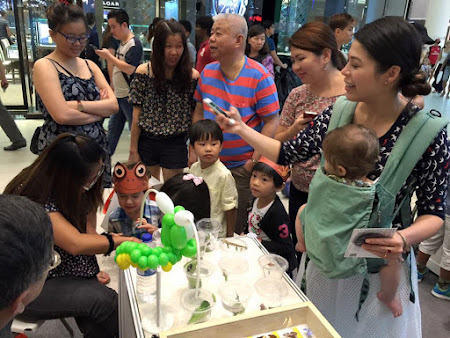 But they were satisfying and rewarding days, as all of us shared our passion and knowledge about butterflies to all the visitors who came to learn more about nature's flying jewels in Singapore. 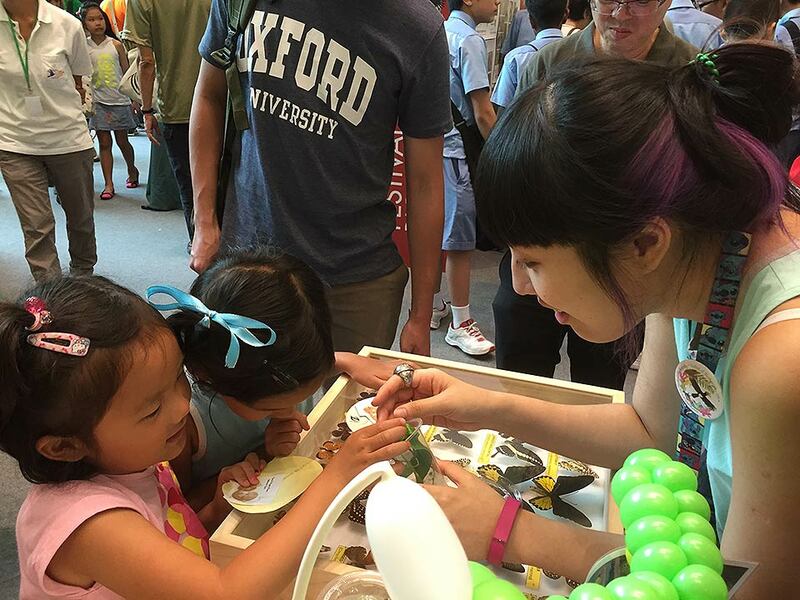 You have to look cool to examine butterflies too! After four years of FOB, it is now important for the Biodiversity Roundtable to take stock of what we have successfully done to create awareness, appreciation and interest amongst the public for our biodiversity. Moving ahead, we will have to ask "what next?". Now that we have greater awareness and support from the public and government agencies, what do we do with it? 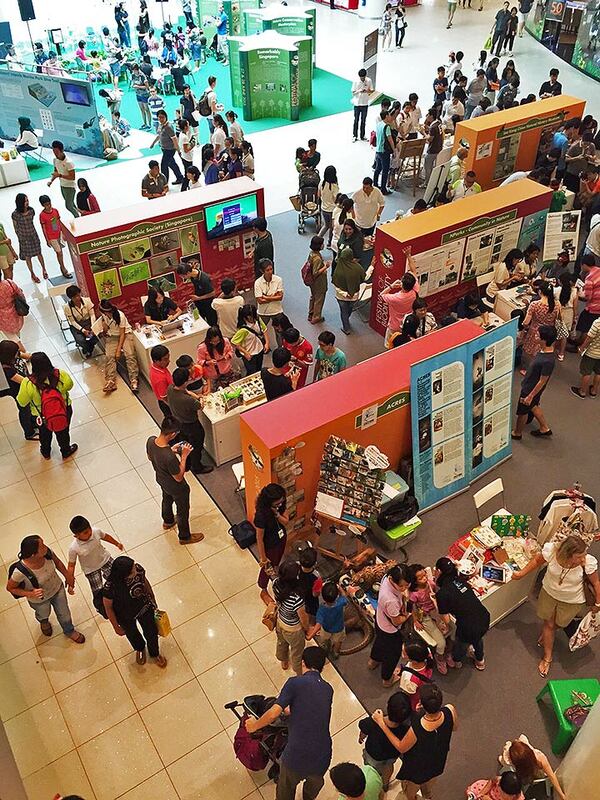 People will ask, so what do we do with our biodiversity? What can we learn and gain from this knowledge? 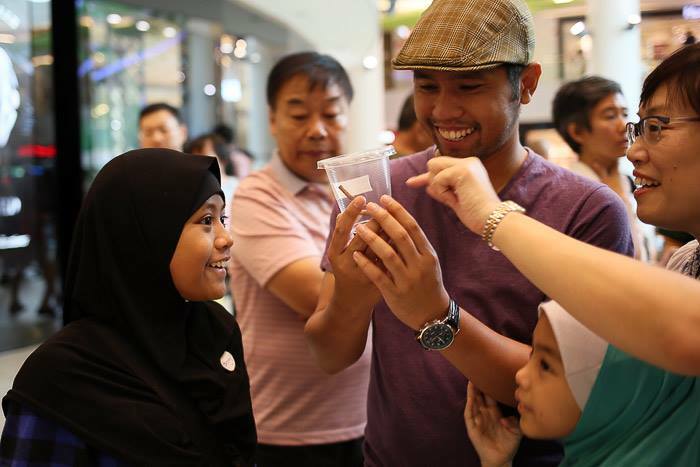 Where will conservation bring Singapore to, in the next stage? 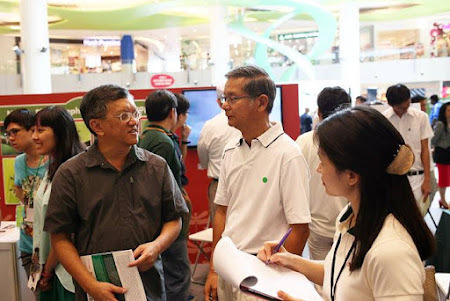 Text by Khew SK : Photos by Chng CK, Bob Cheong, Elizabeth Chow Tjakrawinata, Foo Jit Leang, Khew SK, Huang CJ and Loke PF. A heartfelt note of appreciation to all ButterflyCircle members who volunteered to man our booth and who turned up to support us - Goh EC, Brian Goh, Bob Cheong, Loke PF, Huang CJ, Simon Sng, Jerome Chua, Anthony Wong, Mark Wong, Chng CK, Horace Tan, Federick Ho, Nelson Ong, Tan CP, Nikita Lee, Siaomouse, Koh Cher Hern, Elizabeth, Billy Oh and Jonathan Soong. Special thanks to Foo Jit Leang, Cheng Khim, Mei Hwang, Vanessa and Janice for helping out with the caterpillars and teaching the kids to appreciate our butterflies!